It remained unclear whether Florida's third-most populous county would make the Thursday deadline to complete the vote counting. RIVIERA BEACH, Fla. — Palm Beach County's ballot-counting machines are working again after mechanical issues caused by overheating delayed the ongoing statewide recount, the elections chief said Wednesday — but the county may still miss Florida's Thursday deadline. "We're doing everything in our human power possible to make this happen," election supervisor Susan Bucher told reporters when asked if she would make the deadline. Palm Beach County, the third largest in the state, has emerged as one of the biggest problem spots in the first statewide recount, with the other counties saying they expect to finish their recount in time, even Broward County, which has been plagued by other problems. Bucher has faced a growing chorus of criticism, including from President Donald Trump, but she was defiant when asked about calls for her resignation. "I'm working as hard as I can," she said. "You can see that I haven’t been home in three days. And so I don’t think that you’re going to find somebody else that has the dedication." Bucher said counting equipment overheated Tuesday evening, causing an error in the count for some ballots, but that officials had successfully re-re-counted all affected ballots by Wednesday morning, and two outside technicians were on still onsite in case another problem arises. Still, the machines sat dormant for several hours midday Wednesday as Bucher said to expect a "very long lull" in the count while workers reconciled ballots in one batch of votes before moving on to the next. In the county's cavernous elections warehouse, some employees could been seen hand-sorting ballots while another group appeared to sit idle at a long table along the wall. 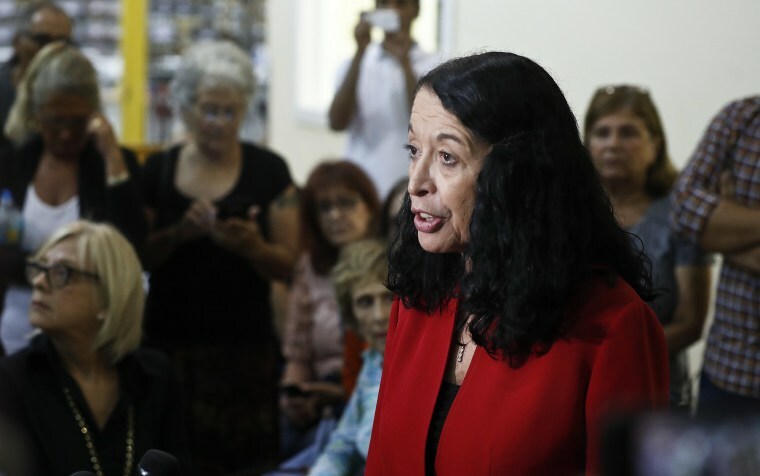 Bucher has blamed out-of-date machines and tight deadlines that she said were better suited for small, rural counties than a large, dense one like Palm Beach. "We didn't anticipate that we would have to run 100 percent of our ballots through these old machines," Bucher said. "We anticipated that we would have a pretty quiet midterm election, as we usually do."